Risk-to-reward ratios consider the amount exposed to loss compared to the amount of potential gain. Risk-to-reward ratios are the magnitude of the gain or loss, not the potential or probability of the gain or loss. When speaking of risk-to-reward ratios, I may speak of the potential of a trade or investment, or I may be speaking about its actual risk-to-reward ratio after the position is closed. For example, at the time of entering a position, I may determine how much I will risk in the position. For example, in the diagram below, I determined I would enter at $50 and I predetermined I would exit if it falls to $45. That is, I am “risking” $5 per share. 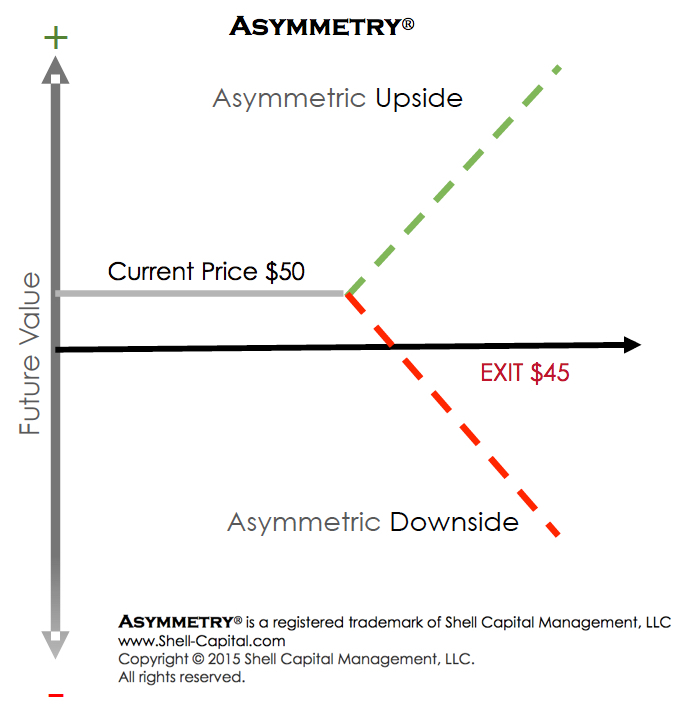 However, I may expect the upside to be asymmetric: it has the potential to gain much more than $5. If we were speaking of an actual trade history, we would defined the risk-to-reward ratio based on the actual amount risked ($5) and the actual profit realized ($10, $15, $20?). The risk-to-reward ratios would be expressed as a multiple of the risk taken to achieve it. With $5 at risk, a $10 gain would be a risk-to-reward ratio of 2. A $20 profit would be a risk-to-reward ratio of 4.